Lawyers around the country protesting over this brutality of Punjab Police, which is already notorious for its inhuman behavior and bad conduct. An anti-encroachment drive turned violent and ended with clash between lawyers and Police. As per reports at least two lawyers were killed in clashes with police in Punjab province's Daska city, forcing authorities to deploy paramilitary forces to contain the unrest. The incident occurred after police and the district administration were carrying out an anti-encroachment operation in Daska city when a group of lawyers asked them not to bulldoze a few shops as the matter was pending in a court. However the police went ahead with the drive that led to violent clashes with lawyers and local residents, local media reported. Three lawyers sustained bullet injuries after police opened fire. All the injured were rushed to a nearby hospital where Rana Khalid Abbas, president of the Daska Bar Association and another lawyer were not able to sustain and lost their lives. The lawyers alleged that station house officer of Daska Shahzad Warraich opened fire on the protesting lawyers and made the clash violent. The lawyers' fraternity took to streets in different districts of Punjab and protested against the police brutality as the report hits TV Channels. The situation remained uncontrollable for hours and Prime Minister Nawaz Sharif took notice of the incident. He ordered a probe, seeking a report from the authorities concerned. 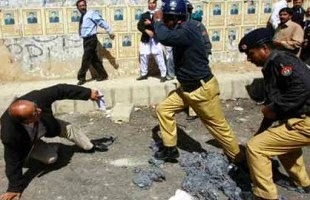 Mr. Sharif said in a statement "Nobody will be allowed to take the law into their own hands". Pakistan Rangers took control of the deteriorating law and order situation in Daska. Lawyers in Lahore tried to enter the Punjab Assembly where the session was underway. The opposition boycotted the session over the killing of two lawyers. Lahore High Court Chief Justice Manzoor Ahmed took notice of the incident and ordered deployment of Rangers in Daska. A couple of days back few masked men attacked journalists in Karachi and thrashed them. Now the bad law and order situation in Daska has erupted more anger in people. Lawyers and Journalists had been remained under targets.